This place is incredible! It’s really worth a visit, you won’t regret it! Este lugar é incrível! 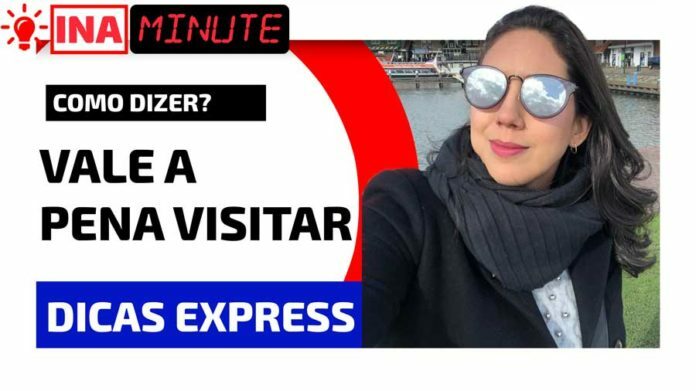 Realmente vale a pena visitar, você não vai se arrepender! It’s really worth reading this book. Vale muito a pena ler este livro. It’s worth watching his latest movie. Vale a pena assistir ao novo filme dele. Is it worth paying 50 bucks for that? Vale a pena pagar 50 dólares por isso? It’s worth talking to him before! Vale a pena falar com ele antes! It’s not worth cleaning the house house now. Não vale a pena limpar a casa agora. Is it worth taking this course? It requires a bit of patience to learn, but it’s well worth it. Isto requer um pouco de paciência para aprender, mas vale muito a pena. It was quite expensive but still worth it. Foi bem caro, mas ainda valeu a pena. It was hard work, but it was worth it in the end. Foi trabalho duro, mas valeu a pena no final. Um lugar que vale a pena visitar. She believes that her freedom is worth fighting for. Ela acredita que sua liberdade é algo pelo qual vale a pena lutar. Her book is definitely worth reading. O livro dele definitivamente vale a pena ser lido. This is a piece of advice worth taking. Este é um conselho que vale a pena tomar (levar em consideração). Próximo PostComo Dizer “Não Entendi” em Inglês? | How To Say It in English?